Two months ago, State Senator Minority Leader Jeff Woodburn (D-Whitefield) was threatening to crack down on sexual misbehavior by senate members if Democrats took control of the chamber. Today, Woodburn faces multiple counts of domestic violence, including repeatedly biting and punching his female victim. It’s just one example of a troubling pattern of comments condemning misbehavior by others at the same time the top senate Democrat was allegedly engaged in violent attacks of his own against a female victim. Woodburn turned himself into authorities on Thursday afternoon and was released on $500 bond. “This afternoon, I learned that a warrant had been issued for my arrest. I voluntarily responded to the police station, cooperated with law enforcement during the booking process, and was released,” Woodburn said in a statement. “I intend to fully address and defend against these charges in court.” He also said he does not intend to resign, despite the bipartisan calls from him to do so. According to the New Hampshire Attorney General’s office, Woodburn allegedly bit his victim, hit her in the stomach, threw a glass of water–and the glass–in her face and broke into her locked residence, among other charges. All of the alleged crimes are misdemeanors, and stem from a series of incidents stretching back to August of last year. State Sen. Jeff Woodburn joined Gov. Chris Sununu at an event promoting Marsy’s Law to protect victims of sexual and domestic violence. During the same time period he was allegedly biting and punching his victim, Sen. Woodburn made repeated public comments portraying himself as an advocate for victims of sexual assault, most prominently his support for the “Marsy’s Law” victims’ rights bill. Woodburn repeatedly urged passage of the bill on behalf of women victims of violence. “We have to take a look at the total issue of whenever a crime occurs, there are many victims, and they deserve a strong voice, and it’s important that their voices be made louder,” Woodburn said at the time. Ironically, if Marcy’s Law were in place, Woodburn’s alleged victim would be covered by it in his case. 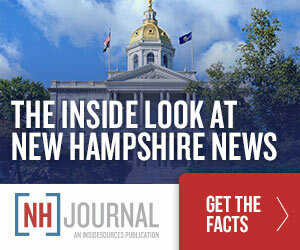 Two months ago during a debate over high absenteeism in the New Hampshire legislature, Woodburn promised to get tough on sexual harassment if Democrats took control of the Senate. He said he planned to take a hard line on sexual harassment policies, threatening members who didn’t sign onto a strict anti-harassment policy with the loss of parking spaces and committee assignments. Hypocrisy isn’t a crime, but domestic violence is. Woodburn is scheduled to be arraigned on August 20th.